Reindeer hunting is an exclusive experience. The Icelandic reindeer population is only 2,500 – 3,000 animals. The Icelandic reindeer was brought to Iceland from Hardangervidda, a mountain range in Norway. The Icelandic reindeer only live in the wild and there have never been any domesticated reindeer in Iceland. There are only 300 hunting licenses issued yearly and most of them are allocated to local hunters. We are only able to take 12-15 foreign hunters each year. 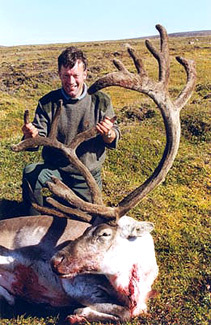 It is not uncommon for us to take at least one reindeer that scores over 300 SCI every year! **You must provide a copy of your passport and a local hunting license BY FEBUARY 10 in order to get your name in the application process. We will know the application results by the end of February. During reindeer hunts, we can offer seal or seabird hunting during a part of the hunting period. WHERE: Egilsstadir, Iceland – a small town on the east coast. WHEN: The reindeer hunting season is from August 1st until September 15th. The prime hunting period is from August 15th until September 1st. ACCOMODATIONS: During the hunt you will be staying in warm and comfortable mountain lodges. In Reykjavik you will be staying in a first class hotel. Day 1 – You will arrive in the afternoon at Keflavik International Airport where you will be met by the outfitter. The outfitter will clear your weapons (if you prefer to bring your own gun) through customs and then transfer you to Reykjavik domestic airport. After a one-hour flight you will land in Egilsstadir, a small town on the east coast of Iceland. There your guide will be waiting for you with a comfortable 4WD vehicle. Day 2 – After a good nights sleep, you will awaken to a warm breakfast at your comfortable mountain lodge. You will take off early to the hunting grounds. If necessary, you will hunt until dusk, then return to our hunting lodge for dinner. Meals during the day will be from lunch boxes. Days 3-4 – Same itinerary as Day 2, unless you already have your trophy! If you have already tagged out, we may be able to offer a Goose hunt, a Seal hunt or salmon fishing. Day 5 – Again we rise early if all our hunters have not already got their trophies. At the end of the day you will be taken to Egilsstadir airport and return to Reykjavik. Dinner and accommodations are at an excellent hotel in Reykjavik. Day 6 – Transfer from the hotel to Keflavik International Airport for departure back to the States. Have a safe return after a successful hunt in the Icelandic wilderness. For more information or to book this package please call toll-free (877) 858-3481 or fill out our contact form.